Happy Halloween! Can y’all believe it’s the last day of October? Remember, November means the launch of V6, so hurry up and place your preorder and/or RSVP to our fabulous launch party! 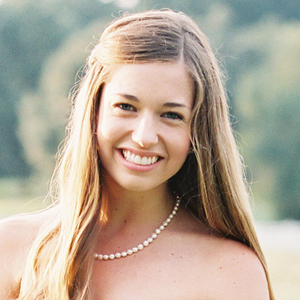 We are so excited to share today’s wedding because Katherine is a longtime SW reader! With her sweet spirit and bubbly personality, we’re not surprised that her wedding to Matt was so lively and colorful. I love the heart she put into planning every detail, but my favorite thing about Katherine and Matt’s big day is her most memorable moment–when the fact that she was getting married that day really hit her. It brought a few tears to my eyes because it was such an authentic reminder that despite the prettiest details, when it’s all said and done, the only thing that matters on your wedding day is becoming husband and wife! We’re so grateful to our delightful Blue Ribbon Vendor member, Katelyn James, for sharing Katherine and Matt’s lovely wedding with us! What was your most memorable moment about your wedding day? There are SO many amazing memories! One of my favorites happened in the bridal suite with my best girls when we were getting ready. Anna (our day-of coordinator) had stopped by to see how I was doing and to bring me a surprise milkshake (so sweet! ), Katelyn James had started taking pictures, and everyone was running around applying hairspray, steaming gowns, and finishing final touches. I walked into the bathroom for a break between my makeup and hair appointments and that’s when it truly hit me–TODAY I’M GETTING MARRIED!!! I started crying and laughing all at the same time! I seriously gets chills just thinking about that moment. There is something absolutely breathtaking about the realization of “come what may, I am his at the end of the day.” As detail-oriented as I am, at that moment I knew our day was going to be perfect, no matter what. Did you decide to do a “first look”? Why or why not? Yes!! I’ve been following wedding and photography blogs for years, and I have a love for first look pictures! (Plus, I’m incredibly close with my father and knew walking down the aisle would be a lot about my relationship with him vs. seeing my groom.) It took a little time to convince Matt, but in the end, we both say our first look was one of the best moments of the day! It also worked well with the logistics of our day since we had a 7 p.m. ceremony. Amanda from Anthomanic did an incredible job of bringing my floral vision to life. My biggest regret is not being able to keep my bouquet alive forever! I told her I wanted big, fluffy and garden-like–that girl didn’t disappoint!! My bouquet was full of bright flowers with ribbon flowing down from it. Since my bridesmaids’ dresses were bright, Amanda created all-white bouquets for them. She also created two BEAUTIFUL wreaths for the church doors and a to-die-for mantle display in the reception home. She had hanging flowers and candles in the crepe myrtles and used the vases I’d collected for all of the centerpieces. I am so grateful for her creativity and how fun she was to work with! We LOVE seeing brides use our Vows print in their weddings! Find them (and lots more fun stuff) in our shop. Tradition. Hospitality. Family. 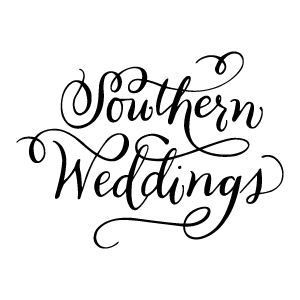 Those are words Matt and I think of when we think of “Southern” and we really wanted to embrace all of them at our wedding! Tradition: We were married in the same church my parents were married in 29 years ago. Our reception venue is an old, historic mansion that Robert E. Lee once visited! Hospitality: We wanted our guests to be comfortable at our outdoor July reception, so we offered fans that doubled as reception programs, bug spray, and a place to rest in the air conditioning, if needed. Family: Our families made this possible. They showered us with love and support and truly made our dream day a reality. My grandmother is the mayor of Fredericksburg, and since our reception venue isn’t typically a wedding venue (it’s normally used for hospital fundraisers), her connections made it possible for us to use it! We also wanted to honor our heritage by creating a Legacy Room at the reception. We displayed both of our mothers’ wedding gowns and pictures going back to our great-grandparents. I’m that girl who’s dreamed about her wedding day her ENTIRE life!! As soon as that pretty ring was on my finger, I went into overdrive. I contacted vendors, pinned until the wee-morning hours, made spreadsheets for absolutely everything, and crafted to my heart’s content. Planning our wedding was an amazing, exhausting, once-in-a-lifetime-I’ll-never-forget-it-ever kind of thing…seeing everything come together? My heart literally burst at the seams! Throwing cake at my husband, dancing with my daddy, and seeing my 80-year-old grandparents kiss on the dance floor made it all matter. Our whole wedding was one big detail I will never, ever forget. Seeing it all come together made every late night, every stress-induced tear, and every joy-filled shriek so completely worth it! How did y’all meet? Tell us your love story. We’re high school sweethearts! He stole my heart in fifth period study hall and asked me out in seventh period yearbook. We passed notes, went to high school dances, and had our first (awful) kiss in his best friend’s driveway (romantic, right?!). I’m a year older, so after high school, I went off to a small college in Bridgewater, Virginia, and the next year, he started attending JMU in Harrisonburg, Virginia (only a few minutes away from Bridgewater, and where we now live). We broke up for two long months my sophomore year of college (which he’ll never let me forget, ha! ), but God had other plans for us and we’ve been together ever since! Tell us all about the proposal! We’d been dating for over five years and boy, was I ready! On July 7, 2012, he told me his friend gave him a gift card that was about to expire, and it just so happened to be at my favorite place in Harrisonburg. After dinner, we headed to Reddish Knob, a lookout point outside of Harrisonburg that we had always wanted to visit. As we drove up there, he started honking his horn like a lunatic, telling me all these bunnies were in the way and they needed to move (what?!)! It turns out his best friend was at the top setting everything up, and since there wasn’t any cell phone service, this was his warning to hide! A few minutes after we got up there, we walked down the trail, turned a corner, and there was an arbor complete with roses, candles, and pictures. He looked at me and said, “Well, who’s this for? !” (silly man!) and then proceeded to ask me to marry him. I have no idea what else he said; I just remember being so shocked, I couldn’t even cry! Matt’s best friend and his girlfriend appeared and told me they took pictures of the whole thing. After we left and got to an area where we had cell service, I was so disappointed that my parents weren’t answering their phone–all I wanted to do was tell EVERYONE! Turns out, Matt had a surprise party waiting for us when we got back. I walked into a room full of my parents and best friends, and tons of screaming/crying!! Tell us about finding your wedding dress. I found my dress when I was least expecting to! My MOH and I went to Fredericksburg to look at a few venues with my mom. When the first venue turned out to be the one, we cancelled the rest of our appointments and gave Ava Laurenne Bride a call. Going into the appointment, I knew I wanted a sweetheart neckline, a little princess feel, and some sparkle. Wendy at Ava Laurenne Bride was AMAZING and gave me the best experience! I tried on several different styles and knew as soon as I put on “the one”–dropped waist, gorgeous lace, and yards of soft tulle. Perfection! Since it was my first time dress shopping, I decided to wait and look at a few stores in Harrisonburg. At the Harrisonburg store, completely overwhelmed by all the dresses, I had the affirmation that the previous dress was really “the one.” I went back to Ava Laurenne Bride with my mom and grandmothers to claim my dream dress. Being the girly-girl I am, I had a gorgeous, sparkly beaded belt custom made for my gown; it was just the something “extra” the dress needed! Describe your wedding cake or dessert. We’re not big “cake” people, so we had a small cake made for us to cut and a dessert bar for the rest of our guests, which included apple crisp, brownies, ice cream, and peanut butter fudge bars. A friend of ours makes the best cakes and we were so grateful she did ours! She made us a custom funfetti cake using only pink and orange, decorated with fun ombre ruffles. She also created a surprise groom’s cake for Matt; his family has a silly joke about the monkey cake his mother made for his 6th birthday. I gave Amanda a picture and she created a chocolate cake with peanut butter frosting that looked just like it! We loved eating it when we got back from our honeymoon. One of my favorite memories is seeing his expression when he saw it for the first time at our reception! Did you have something borrowed, blue, old, and new? If so, do tell! I have always loved this tradition and really wanted to incorporate all the great women in my family. My something borrowed was wearing a penny in my shoe that my maternal grandmother wore on her wedding day. My something blue was a blue topaz ring my maternal grandparents gave me when I graduated high school. I had two for the “something old” category: 1. the lace sewn onto my veil; it came from my paternal grandmothers gown. And 2. I made my hair comb out of lace from my mother’s veil. Lastly, my something new was a handkerchief given to me by my matron of honor. I highly recommend having a wedding handkerchief–I was very emotional and am so glad I had one. Plus, now I can pass it on to my children for their something old or borrowed! What was the biggest challenge you had to overcome while planning your wedding? Budgeting is always really hard, and since I’m the only daughter, I know it was hard for my mom too! We also struggled with narrowing down the guest list. What is the one detail or vendor that you were so happy to have as a part of your wedding? Katelyn James Photography!! Hands down, she and her husband Michael are absolutely amazing and we are so grateful they shot our wedding! They made wedding day pictures go so smoothly (even with a large bridal party and the July heat) and they were so much FUN to work with! We are going to cherish our pictures for the rest of our lives, and I can’t wait to one day show them to our children and grandchildren! What advice do you have for folks currently planning a wedding? On your wedding day, you get to be the bride (yay! ), which means you need to trust the people you hired to make your day happen so you can relax and enjoy it! Make sure you have an amazing planner so your day runs smoothly, a great photographer to capture those priceless memories, and if you can, hire a videographer. Our video makes me laugh and cry every single time, and I’m so glad we re-worked our budget to fit videography in there! What’s next for you as a couple? What are you most looking forward to about married life? Since we’ve been together for so long, it means so much to finally say “husband” and hear him say “wife!” Right now, we’re loving the “ordinary” things about marriage: living together, home cooked meals, weeknight TV sitcoms, and football season. We’re so excited to see what the Lord has in store of us!! Katelyn James is a delightful member of our Blue Ribbon Vendor Directory! the bridal party looks so awesome! reminds me of the lilly pulitzer wedding in V5! Im in love with the bridesmaids dresses. what designer are they?